ABC7 has taken another giant step into the digital future with our WATCH ABC, an app that will allow viewers in the San Francisco Bay Area to watch a live stream of ABC7 programs online and on their smartphones, tablets, and other devices! Below are some frequently asked questions if you are accessing WATCH ABC. If you have a question or need support for something that is not covered below, please call: WATCH ABC Customer Care: 1-800-230-0229. WATCH ABC lets you view the ABC network live or on demand on various devices like smartphones, tablets, and your computer. It puts access to the network right into your hands at home or on the go. Just sign in with a participating TV provider to start watching live and to view advantage window video on demand. What changes are coming to WATCH ABC? Access to ABC episodes within one week of air will be available to subscribers of the below participating TV service providers. If you subscribe to any of these participating TV providers, verify your account with a username and password by following the on-screen prompts on WATCHABC.com or in the WATCH ABC app. If you don't have a username and password, contact your TV provider customer service department for help. If your provider is not listed, we're working to add more. 1. Check your TV provider's video on-demand offering. Most offer next-day viewing. 2. You can access episodes on WATCHABC.com and the app a week after they air. 3. New episodes are also available with a subscription to Hulu Plus, or for purchase on iTunes and Amazon Instant Video. Why has access to on-demand episodes changed? Pay TV service providers are a key part of the television industry in delivering broadcast content through new technology platforms. Now, with the support of participating pay TV service providers, the ABC network is able to continue to bring live entertainment, news and sports programming on a national and local level as well as the latest on-demand episodes on new, emerging digital platforms at no additional cost to their subscribers. This approach also allows ABC to offer several on-demand episodes that are available to everyone. How do I watch the most recently aired episodes on demand? To watch the most recently aired episodes, sign in with your participating TV provider username and password. All you have to do is select your participating TV provider from the list, verify your username and password, and start watching! You can also watch several episodes without signing in. If you don't have a subscription with a participating TV provider, you can still see several recent episodes on WATCH ABC. You only need to sign in to view the most recently aired episodes. New episodes are also available for purchase on iTunes and Amazon Instant Video; or with a subscription to Hulu Plus. On-demand viewing through a set-top box provider is another way to catch up on recently aired episodes. What if I can verify to watch full episodes on-demand with my participating TV provider, but I can't view the live stream? The WATCH ABC live stream is currently available in only select geographic areas with more on the way. Go to GETWATCHABC.com to check availability in your area. If your TV provider doesn't yet support it, you can let them know you are interested in WATCH ABC and the great ABC programming it offers by calling or filling out an easy online form on GETWATCHABC.com. What is the VERIFY TO WATCH label? VERIFY TO WATCH is the label that helps users identify which episodes require them to sign in with a participating TV provider. If I have a participating TV provider at home and already verified my information, but travel to another place, can I always view the live stream? Geographical restrictions may apply. In some cases, your participating TV provider isn't available in your destination. Or the local station in your destination isn't included in the live stream yet. TV providers and live streaming vary by location. If I have a participating TV provider in my area and can access the live stream, can I always view the latest, aired episode on demand? Geographical restrictions may apply. In some cases, your participating TV provider does not support all on demand features even though you can access the live stream. Where can I get WATCH ABC? Is there an extra cost for WATCH ABC? WATCH ABC is brought to you by your local station and participating TV providers at no additional cost. It's included in your TV subscription service. Program substitutions may apply for live programming. The live stream is currently available in several U.S. markets with more on the way. WATCH ABC will automatically detect your location to make sure there's a live stream available. Then just verify your participating TV provider and start watching live. This means you can view the same programs currently on air on your local ABC station. 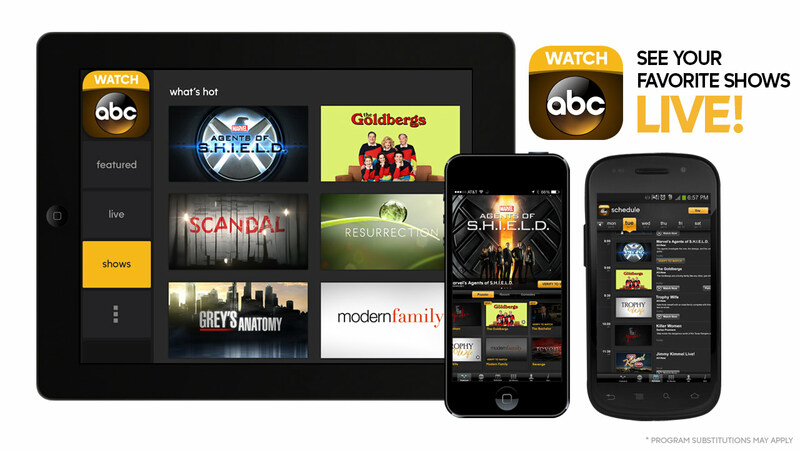 You can enjoy your favorite ABC TV shows, sports, and local news & weather live on your smartphone, tablet, computer and other connected devices. Program substitutions may apply. When are new episodes added to the player? New episodes are typically added the day after they air on TV. Are the apps free to download? Kindle Fire (2nd Gen), Kindle Fire HD 7.0", Kindle Fire HD 8.9"
Google Nexus 7" & 10"
Samsung Galaxy Tab 2 7" & 10.1"
Samsung Galaxy Note 8" & 10.1"
If your device has the supported version of Adobe Flash listed in our system requirements, you may find that our site works in your mobile browser, but we do not support devices not listed and cannot guarantee that WATCH ABC will work as intended on your device. Why isn't the Live Stream available for my location? The WATCH ABC Live Stream for your local station is determined by your physical location. You must access the WATCH ABC Live Stream within each available station's local viewing area. Although it's currently available in select U.S. cities, we are working to make it available to all of our viewers. If your TV provider isn't currently participating, go to GETWATCHABC.comto ask for it! WATCH ABC is brought to you by your local ABC station and participating TV providers at no additional cost. Live Stream is currently available in the following areas: Philadelphia, New York City, Los Angeles, Chicago, San Francisco, Raleigh-Durham, Houston, and Fresno. You must be located within each available station's local viewing area and must verify your participating TV provider account for access to the WATCH ABC Live Stream in your area. It's included with your TV subscription services. Program substitutions may apply. Why doesn't the Live Stream match what's on my live TV broadcast? The content programming in the WATCH ABC live stream may differ from what's on your TV screen. Program substitutions may apply. Is WATCH ABC available outside the U.S.? WATCH ABC is only available if you're physically located within the U.S., its territories (including Puerto Rico, Guam, Saipan, American Samoa, U.S. Virgin Islands) or Bermuda. WATCH ABC is only available if you're physically located within the U.S., its territories (including Puerto Rico, Guam, Saipan, American Samoa, U.S. Virgin Islands), or Bermuda. Also, you must not access WATCH ABC via an anonymous proxy IP address. Please use our online feedback form to submit a ticket if you're incorrectly getting an Out of Country message. Why isn't my video playing? Here are a few things you can try to fix the situation. 2. Check your Internet download speed (Internet download speeds should be 1.5 Mbps or better). Your wifi or mobile signal indicator does not correlate to your download speed. There are a number of web sites where you can conduct a free "Internet speed test." 3. Check to see if you can view videos from other sites. 4. Refresh your browser or close your browser or app and re-open it. 5. Close other computer applications that may be open at the same time. 6. Clear cache and cookies on your browser, and try again. 7. Restart your computer and try again. 8. If none of the suggestions above solved your problem, please contact us via our online feedback form. 1. A high speed Internet connection with sufficient download speeds of 1.5 Mbps or better. 2. Adobe Flash Player 10.2 and above. Video Playback: How do I install or upgrade the Adobe Flash Player? On the computer, our video player requires Adobe Flash 10.2 or above. Download the free Adobe Flash plug-in on Adobe's website. 1. Select Chrome in the menu bar. 3. Click "Show advanced settings" at the bottom of the browser. 4. Click Content Settings in the "Privacy section." 6. Click Done to update. 1. Select Firefox in the menu bar. 5. Scroll down until you see the section labeled "Scripting." 6. Under "Active Scripting," select Enable and click OK.
3. Click the Internet Options icon. 6. Select "Override automatic cookie handling" under the "Cookies" section in the Advanced Privacy Settings window. 7. Select the "Accept" or "Prompt" option under "First-party Cookies." 8. Select the "Accept" or "Prompt" option under "Third-party Cookies." 9. In the Internet Options window, click OK to exit. 3. Set "Firefox will:" to "Use custom settings for history." 4. Set "Firefox will:" to "Use custom settings for history." 3. Click "Show advanced settings&" at the bottom of the browser. 1. Select Safari in the menu bar. 3. Click Privacy in the top panel. 4. Under "Block cookies" select "From third parties and advertisers." I'm getting an Adobe Flash shared objects error message.What do I do? The Adobe Flash shared objects error message occurs when your Flash storage settings are either too limited or set to "None." 2. Uncheck the box "Never Ask Again"
- Use the slider to increase your storage settings to "Unlimited"
- Select "entitlement.auth.adobe.com" and uncheck the box "Never Ask Again"
4. Reload the WATCH ABC page that you were on." Make sure you have a good connection for the best video viewing experience. Sometimes you may experience issues if the network is congested, your connection is weak, or when you have too many apps open at the same time. 2. Check your Internet download speed. Internet download speeds should be 1.5 Mbps or better. Your wifi or mobile signal indicator does not correlate to your download speed. There are a number of web sites where you can conduct a free "Internet speed test". Do an Internet search. 3. Refresh your browser and try again. 4. Drag the rewind scrubber back in time several minutes in the program timeline. 5. Close other computer applications that may be open at the same time, which can drain memory or processing power. 6. Disconnect other Internet (e.g. WiFi) connected devices that may be connected at the same time. If none of the suggestions above solved your problem, please contact us via our online feedback form. How do I clear "Me" History? It's easy to do -- just click the "Clear All" button in the "Me" tab. Closed captioning is available whenever you're watching full episodes. Click on the "CC" logo on the player controls to turn on or off closed captioning. If you're watching the live stream, most shows have closed captioning available. For any issues regarding closed captioning, the best way to contact us is to use our online form to submit a ticket. Alternatively, you can contact Khai Tran with Disney-ABC Digital Media. Please include "Closed Captioning" in the subject of your email. You may also contact us by phone at 818-962-4096, by fax at 818-450-0493 or by mail at 3800 West Alameda Ave., Burbank, CA 91505. Please note that this is for closed captioning inquiries only. I can't find the episode that I was watching anymore. What happened? The episode or program may have expired and is no longer available on our site. If it has expired, we unfortunately no longer have the rights to distribute it online. The expiration for each show, episode, and movie varies, but expiration messaging will appear on each video content one week before it's due to expire. How can I find the ABC Programming TV schedule? From the WATCH ABC app, click the "Schedule" tab to see what's on. Yes, if you're on the same computer and Internet browser, the player will automatically remember where you left off and allow you to resume the video you were watching. Select the "Me" section to see your viewing history and resume your video, if it has not expired. Full Screen viewing is available. To get into Full Screen mode, move your mouse over the video player and the player controls should appear. Click the icon on the far right in the player controls, which should expand the player to full screen. When in Full Screen mode you can exit by clicking the icon again. The player control bar will disappear after a few seconds once the mouse has been inactive. To get the player control bar to re-appear just move the mouse. Another way to get out of Full Screen mode is to click the ESC key on your computer. Does the WATCH ABC app support iCloud for syncing between iOS devices? Yes, the WATCH ABC app supports iCloud for syncing between iOS devices. This syncing feature allows you to maintain your viewing history and resume videos across devices. iCloud needs to be activated on all devices for this feature to work. To check whether you have iCloud enabled, tap on "Settings" from your home screen, then "iCloud." If you're not signed in to iCloud, you will need to sign in with your Apple ID and password. You will need to also sign in to iCloud on your other iOS device(s) using the same Apple account." Sorry, AirPlay on Apple TV is not currently supported, but WATCH ABC is available as an Apple TV app. While downloading the WATCH ABC app, the download got stuck before finishing. If the app download icon appears stuck, you will need to delete and reinstall the app. 3. Tap "Delete" to remove the application and all of its data from your device. 6. Search for "WATCH ABC" and then download it again." What is a TV provider? A TV provider is the company you pay in order to get your television service, like a cable company, a satellite company or a telco (also called a telecommunications company). Go to GETWATCHABC.com to check availability in your area. If your TV provider doesn't yet support it, you can let them know you are interested in WATCH ABC and the great ABC programming it offers by calling or filling out an easy online form on GETWATCHABC.com. What participating TV providers are currently available? "Verify" is the process of confirming your current TV provider username and password. If you subscribe to a participating TV provider, verify your account with a username and password by following the on-screen prompts on WATCHABC.com or in the WATCH ABC app. Do I have to verify every time I use WATCH ABC? No. Once you verify, you won't have to re-verify every time you use WATCH ABC. Typically, participating TV providers require re-verification every 30-90 days. And remember, you can access several episodes on demand without signing in. What if I forgot or don't have a username and password? Please visit your participating TV provider's website to register for a username and password. Or give your participating TV provider a call for more information. You should use the username and password for your participating TV provider. Does ABC access my participating TV provider account information? We do not access your username, password, email address, or any other information about your participating TV provider account. How can I find out if my TV provider is participating? What if they aren't participating yet? Go to GETWATCHABC.com to check availability. If you don't see your provider on the list, don't worry. We're working hard to add more providers in the near future, and you can always contact your provider and let them know you are interested in WATCH ABC and the ABC programming it offers. It's easy to sign out, but the process can vary depending on your TV provider. Check your TV provider's website to find out how to sign out. You can also sign out in the top right corner of the "Me" tab in our apps or the "My Profile" section on our web site. What if I forgot my TV provider's username and/or password? If you have forgotten your TV provider's username or password, you can retrieve your login info directly from your provider's help and support site. My TV and Internet provider aren't the same. Which one do I use?